(Commondreams.org) – The U.S. Justice Department on Thursday indicted WikiLeaks founder Julian Assange for a “computer hacking conspiracy,” a charge some corporate talking heads and reporters immediately touted as evidence that journalism is not under threat. 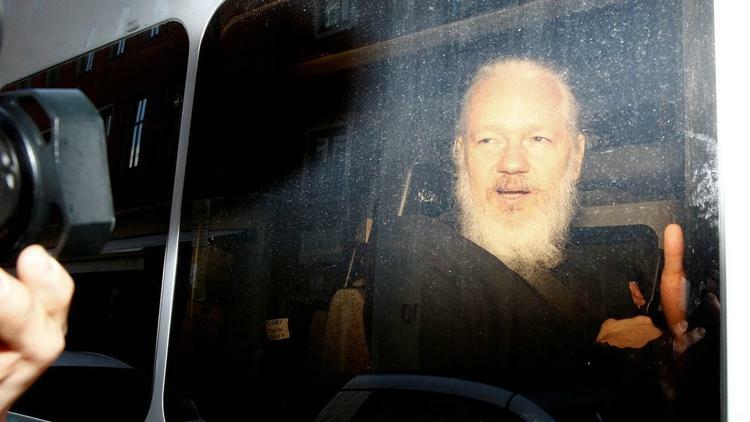 “Indictment of Assange charges him with hacking, not publishing, a crucial difference for First Amendment concerns,” tweeted David Lauter, Washington bureau chief for the Los Angeles Times. But press freedom advocates, Assange’s attorneys, WikiLeaks staff, and other critics warned that the exact opposite is the case—and argued Assange’s extradition to the U.S. would set a dangerous precedent for journalists everywhere. “This precedent means that any journalist can be extradited for prosecution in the United States for having published truthful information about the U.S.,” Jen Robinson, Assange’s attorney, told reporters during a press conference in London on Thursday. Speaking alongside Robinson, WikiLeaks editor-in-chief Kristinn Hrafnsson argued the Justice Department’s seemingly narrow indictment of Assange for “hacking”—rather than a more sweeping charge for the act of publishing classified information—is an “obvious” ploy to boost the likelihood that the U.K. will extradite him to the United States. The Justice Department alleges in its indictment (pdf) that Assange conspired with U.S. Army whistleblower Chelsea Manning to hack into a Pentagon computer network. The indictment also states that Assange “encouraged Manning to provide information and records” from U.S. agencies, worked to “conceal Manning as the source of the disclosure,” and used an encrypted chat service to “collaborate” on the release of classified information related to Guantanamo Bay as well as U.S. wars in Iraq and Afghanistan. Despite these ominous warnings from press freedom advocates, many reporters and cable news pundits continued to loudly parrot the Trump Justice Department’s line, claiming the indictment is not a threat to journalism. “The indictment makes it clear that this has nothing to do with the publishing of materials,” tweeted NBC News journalist Tom Winter. Glenn Greenwald, co-founder of The Intercept, was quick to push back. “I’m not surprised to see NBC journalists uniting behind Trump DOJ to justify the criminalization of WikiLeaks—NBC is fully aligned with the CIA/NSA long obsessed with destroying [WikiLeaks]—but this tweet is false: the indictment also charges Assange with encouraging his source,” Greenwald tweeted. In a column late Thursday for the Washington Post, veteran journalist and editor Margaret Sullivan warned her industry colleagues against ignoring the principles this case calls into question. While “casting him to the wolves as nothing but a narcissistic, bad actor—’not like us,’ of course—may seem tempting,” she added, the consequences could be dire.